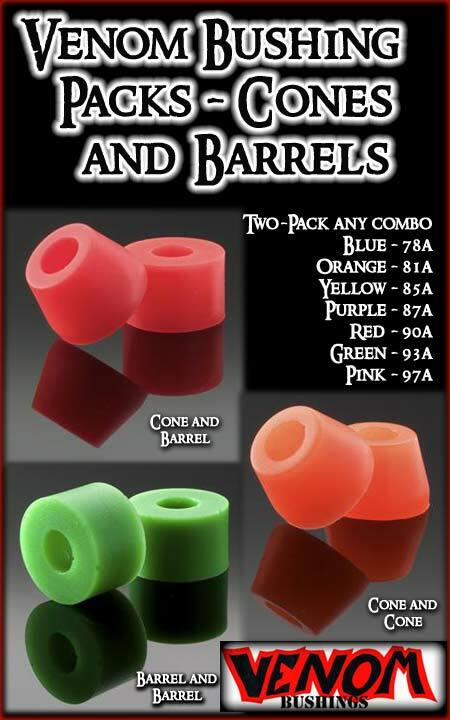 Your favorite Venom bushings are now available in mix and match two-packs. You call it -- barrel or conical. Sold in two-pack -- enough for one truck. Choose duro and specify barrel or conical style choice when ordering. To mix duros in one 2-pack -- just specify your choices in the notes section when ordering. We can customize a pair to fit spherical bearing type trucks such as Radikal by adding a bevel and slight height trim to fit as needed. Choose option when ordering. Specify truck details in notes when ordering. Choose this option to add top and bottom cupped washer set to your bushing order.